Mastering Beauty features wisdom and inspiration from highly regarded doctors of aesthetic medicine who are uniquely introduced in both personal and professional contexts. Of the 15 contributing doctors, three have been elected to the esteemed American Society for Aesthetic Plastic Surgery's office of president. The doctors represent a diverse geography, from Honolulu to New York City, Vancouver to Florida. Beautiful environmental portraits capture the doctors doing what they love most—practicing medicine, spending time with their families, and engaging in leisure activities. Profiles present the doctors' backgrounds and philosophies, while additional chapters highlight their opinions on important topics, like how to choose a doctor; the benefits and drawbacks of surgical and nonsurgical procedures; and tips for staying youthful. Readers will especially enjoy recommendations and cautionary tales regarding popular procedures, and a section devoted to outrageous requests. 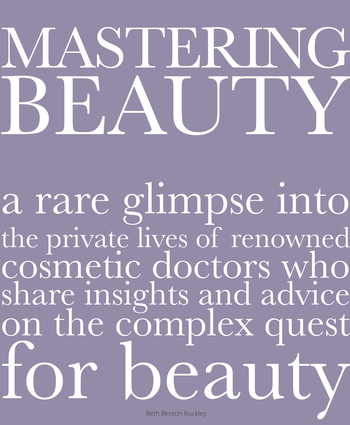 Intended for readers with varying levels of knowledge on the subject, Mastering Beauty has plenty of inspiration for navigating the ever-changing world of cosmetic medicine. Beth Benton Buckley has conceptualized, designed, and curated dozens of titles in myriad subjects including: architecture, celebrity event design, hospitality, interior design, travel, and wineries. She is the author of I Do… Destination Florida and Love Is Love. She lives in Delray Beach, Florida.